Getting in on the ground floor starts with finding the perfect ground. When we find undeveloped space with potential, we develop it into state-of-the-art buildings with amenities that attract major tenants. Keystone assembled a five acre property in downtown Conshohocken to create a mixed-use, transit-oriented development in a public/private partnership. The premier location offers unmatched potential to develop a signature destination that captures the heart and soul of the Conshohocken community. The vision for this project is one that solves problems and creates opportunities with the establishment of public green space around which office, hotel, retail and parking anchors are located. Plans for SORA West include two office towers with over 400,000 SF of office space, three parking garages that will house over 1,500 spaces and a 10-story luxury hotel. Additionally, this complex will include restaurants, retail space, and a plaza for public events. 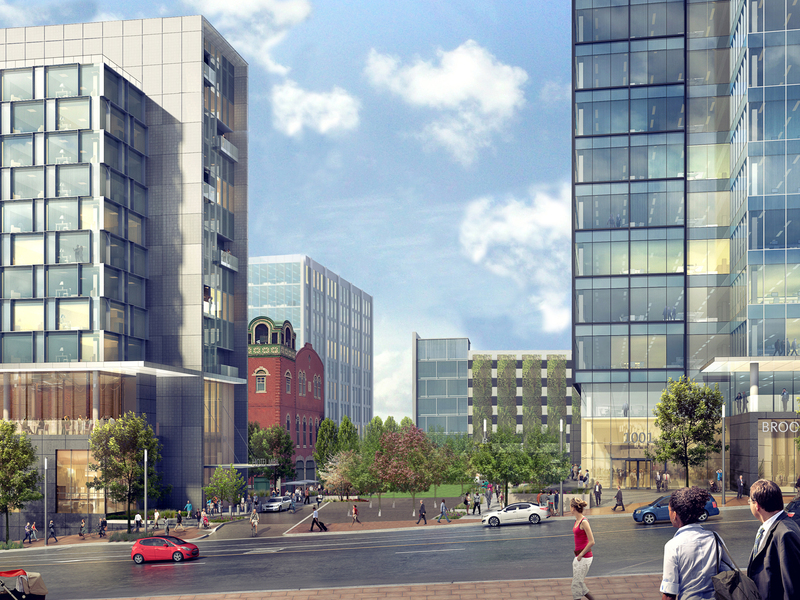 Keystone has partnered with renowned architectural firm, Gensler, to execute this vision. As a premier destination, SORA West will create a unique, memorable and contextually relevant place within the downtown district. The development integrates every building and activity in an urbane and compelling way, so the whole is much greater than the sum of its parts. Every outdated property has the potential for a state-of-the-art future. With the right updates, we take older buildings & make them young again. 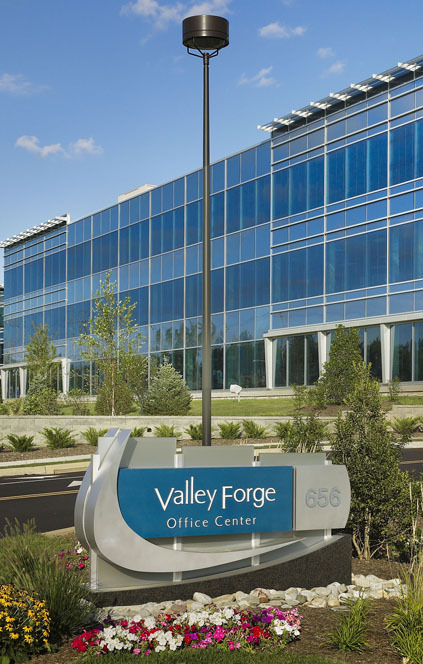 Valley Forge Office Center is a six-building, 34-acre office complex located in Wayne, PA. Keystone recognized an opportunity to disaggregate the portfolio by selling the buildings individually and forming commercial condominiums, as well as to expand building areas and create institutional floorplates. Keystone deployed a multi-strategy approach to unlock the potential of the property, including: a legal strategy for disaggregating the assets; a financing strategy to separately finance portions of the project; a redevelopment strategy that transformed the asset into modern office space; and, a planning strategy to buildout additional square footage. Separate condominiums were created to isolate the high-credit, long-term cash flow in Buildings 530 and 580 from the other four buildings with less certain revenue. These four buildings were revamped with exterior and interior renovations. Floorplates were expanded, adding an additional 27,000 RSF, as well as an impressive, three-story atrium lobby connecting Buildings 656 and 676. 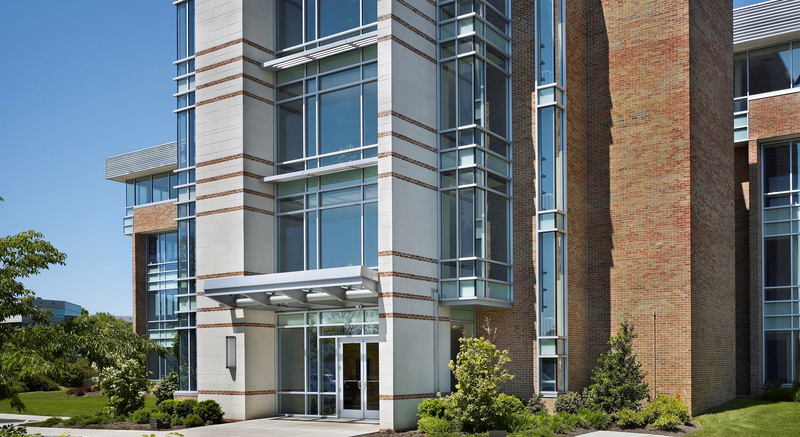 Keystone transformed a Class-B office park into a Class-A asset, and proceeded to sign leases with high-credit tenants at premium rental rates, 16% to 32% higher than the rates at acquisition. The next generation of development is about being in two—or four—places at once. That means creating mixed-use properties where office, residential & retail spaces coexist in a vibrant, connected environment. 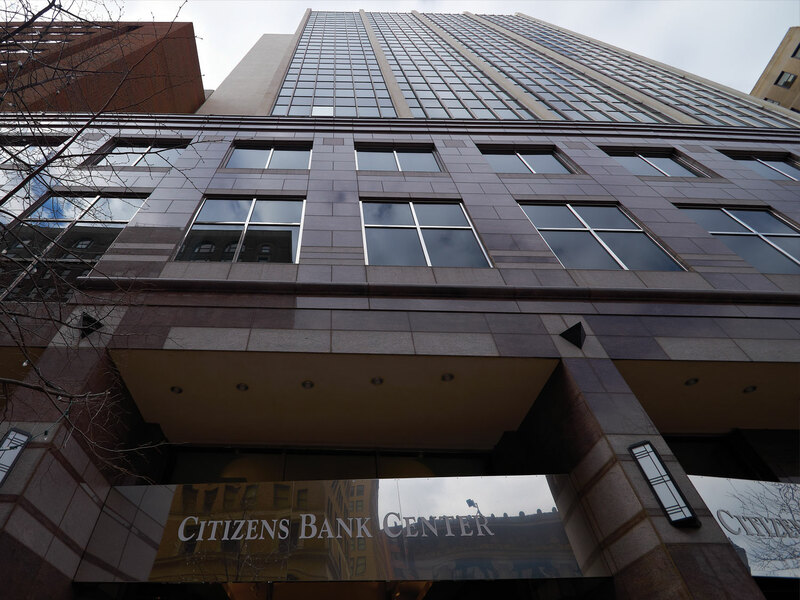 In June 2014, affiliates of Keystone Property Group and Mack-Cali Realty Corporation (NYSE: CLI) jointly purchased Curtis Center, an iconic Class-A office and retail building overlooking Independence Hall and Washington Square Park in the heart of Center City, Philadelphia. 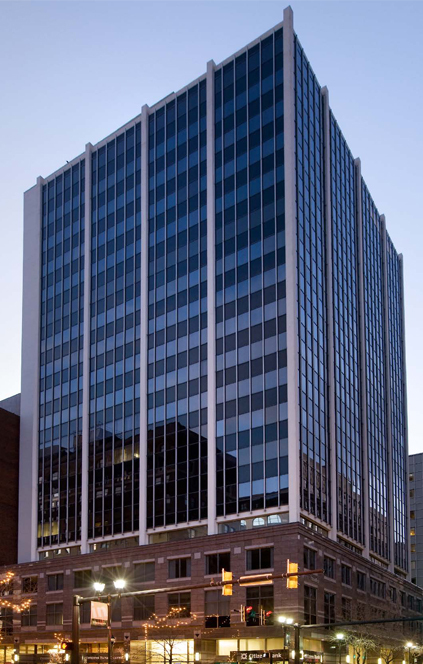 Totaling approximately 885,000 square feet and comprising an entire city block, Curtis Center is home to a variety of commercial tenants, including the General Services Administration (GSA), the building’s anchor tenant, along with ground-floor retailers. 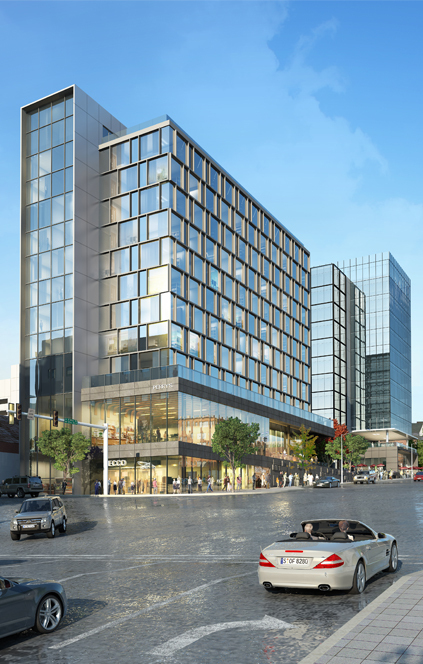 Reposition the property into a dynamic, mixed-use environment through the creation of luxury rental apartments within a portion of the existing office space, and an enhanced pedestrian experience along the surrounding street scape. 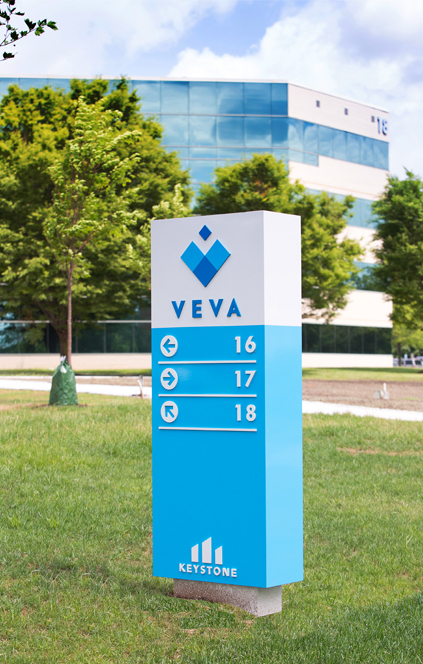 Additionally, execute capital improvements, including substantial upgrades to the elevators and renovation of the building’s HVAC system, roof, façade and parking garage. 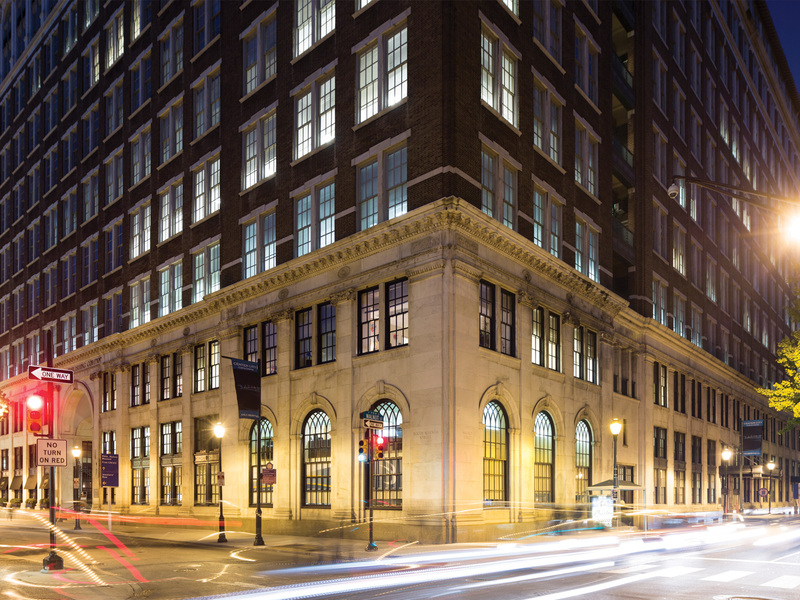 Residential development presently includes converting 99,000 SF of office space into 63 residential units now including four, two-story, luxury penthouse apartments. Residential amenities will include fitness and yoga centers, golf simulator, board room and laundry room. A new restaurant will be featured on the corner of Walnut and 6th Streets with landscaped outdoor seating and views of Washington Square West and the Independence National Historic Park. 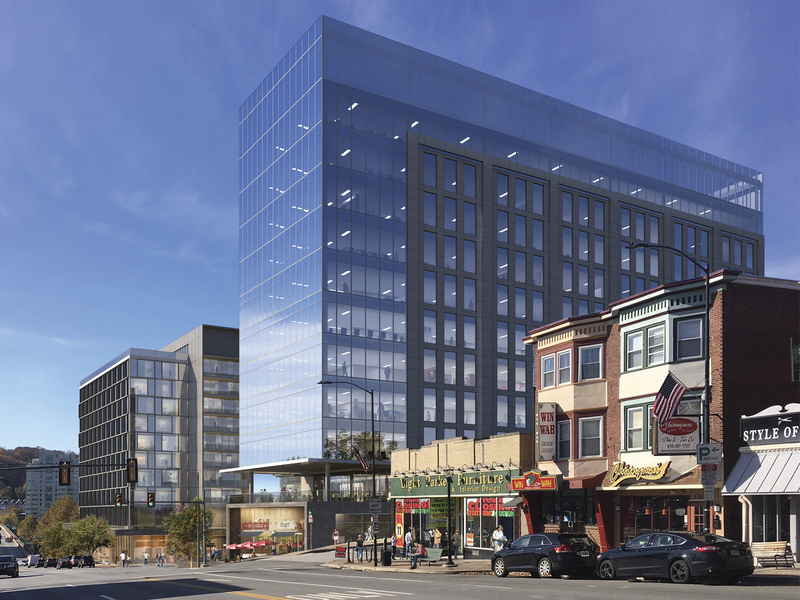 An affiliate of Keystone will manage the office and retail portions of the building, while Roseland, a subsidiary of Mack-Cali, will be responsible for the design, construction, leasing and management of the residential component. 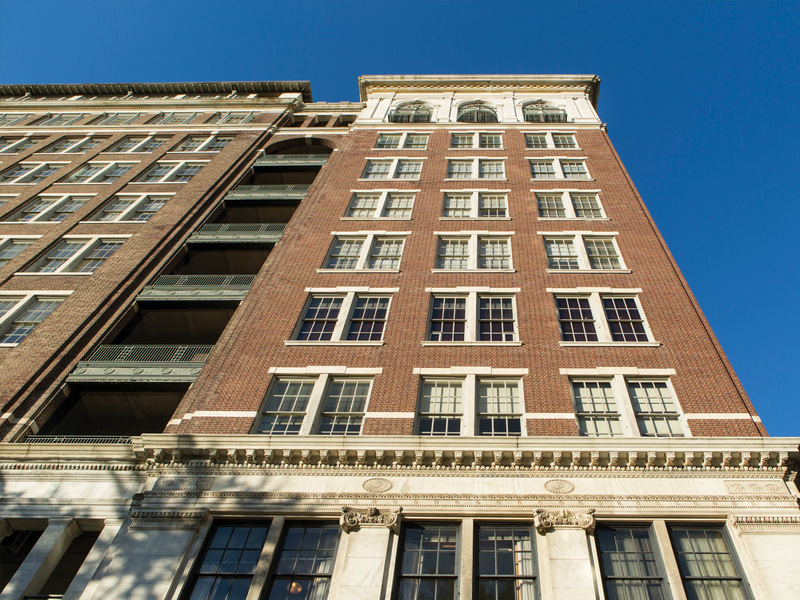 Companies that own their buildings benefit from having a partner in Keystone. Transitioning from owner to tenant allows them to focus on improving their business while we improve the space they live in. 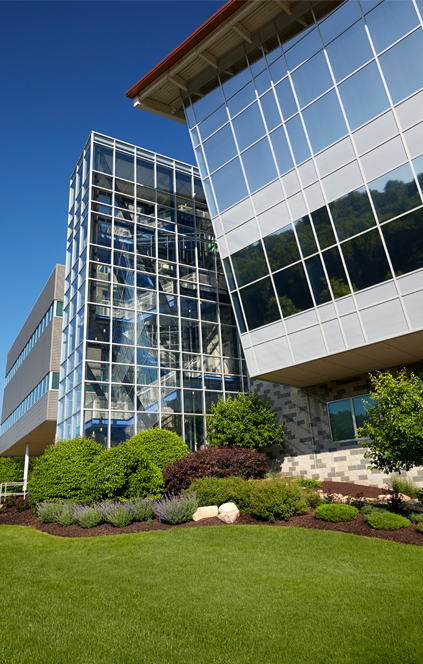 Keystone acquired this user-owned complex from Ericsson, Inc., a world-leading telecom supplier in Warrendale, PA which is 15 miles from Pittsburgh. This is one of the fastest-growing areas of residential, retail and office construction in the state. At the time of acquisition, the occupancy rate for the park was 74%, below market occupancy rate. 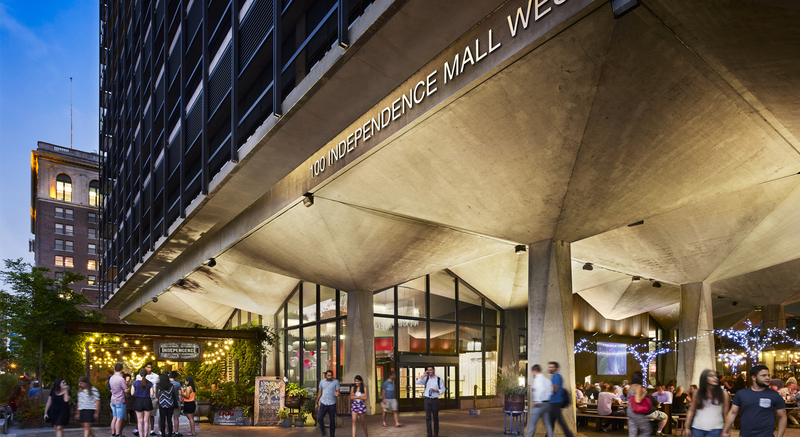 The strategy was to acquire the property at a below-market occupancy rate of 74% and create significant value by redeveloping it, leasing a significant portion back to Ericsson and aggressively marketing the remaining space to new, large-credit tenants. 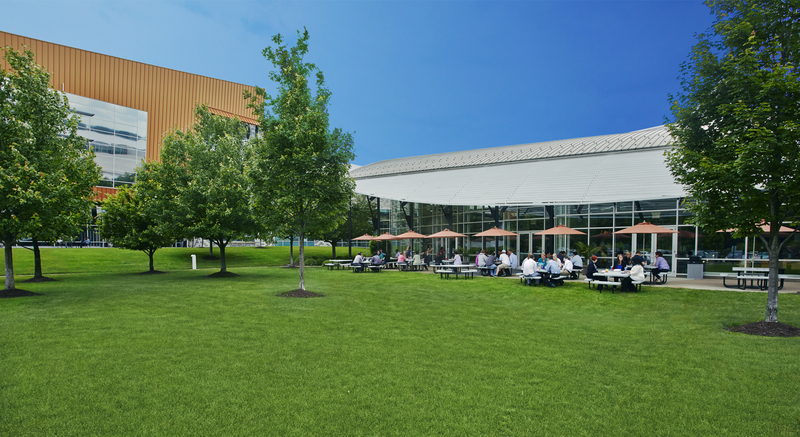 Keystone rebranded the campus and focused on boosting occupancy and net operating income. Operating expenses were cut by 33% through rebidding service contracts and establishing a baseline for utility expenses. Lastly, Keystone obtained land approvals to build up to an additional 150,000 rentable square feet. Keystone leased the building to 100% occupancy within three months of ownership. 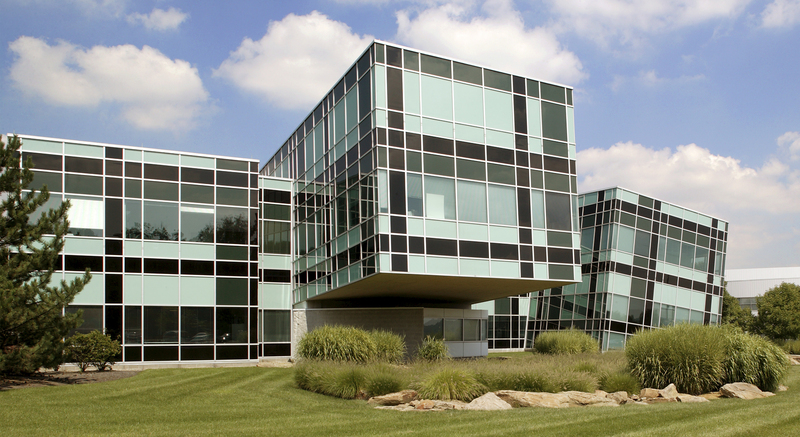 Heinz, an existing tenant, leased an additional 20,000 square feet. New tenants included Federated Investors at 93,000 square feet and Exco North Energy at 56,018 square feet. Also, Ericsson determined it no longer needed its leased space. Keystone negotiated a buyout with Ericsson and leased its space to Westinghouse Electric Company for 15 years. When a property is obscured by financial distress, we see an opportunity to think creatively, rebrand, renew & transform the property into a thriving investment. Keystone previously owned this property, acquired and sold in 2002 and 2005, respectively. In 2012, Keystone capitalized on an opportunity to re-purchase the asset out of bankruptcy court. The property required funding for tenanting costs and building improvements, and by finding a joint venture partner, Keystone would complete the renovations and further diversify portfolio risk. To bring this property to its full potential, it needed a complete rebrand. 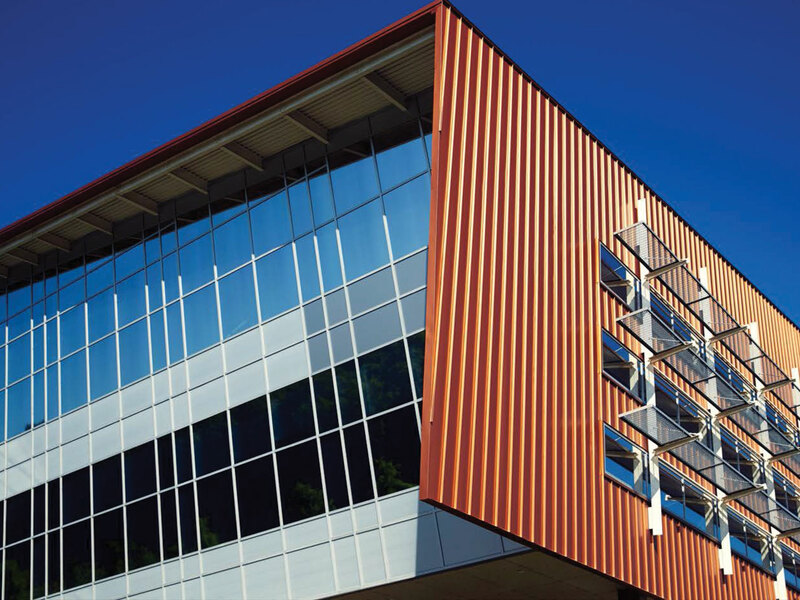 Keystone partnered with a joint venture partner who invested 70% of the equity while Keystone retained control of the asset, and from there, took the building to the next level. Improvements included upgrades to the common areas, restrooms and elevators. Enticed by competitive rental rates, existing tenants renewed and expanded. 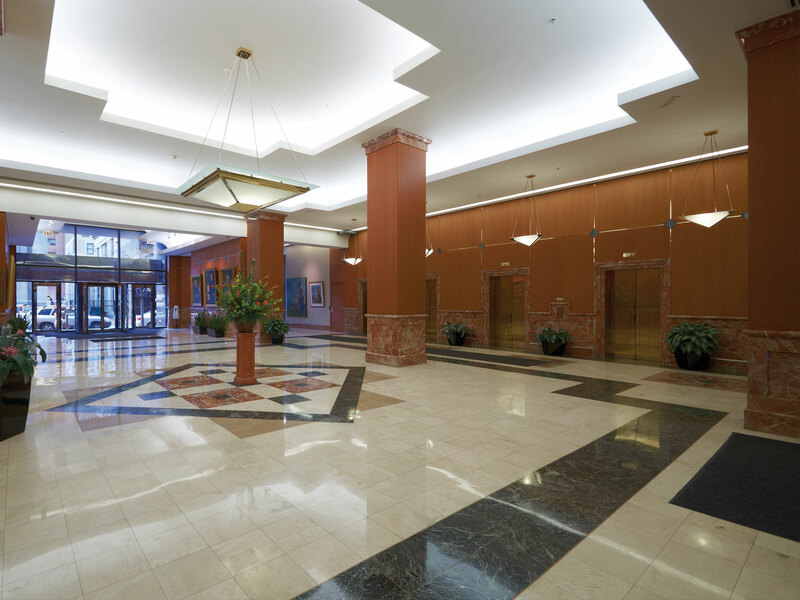 Keystone transformed this building into an exceptional office space with completely renovated elevators, bathrooms and common areas. 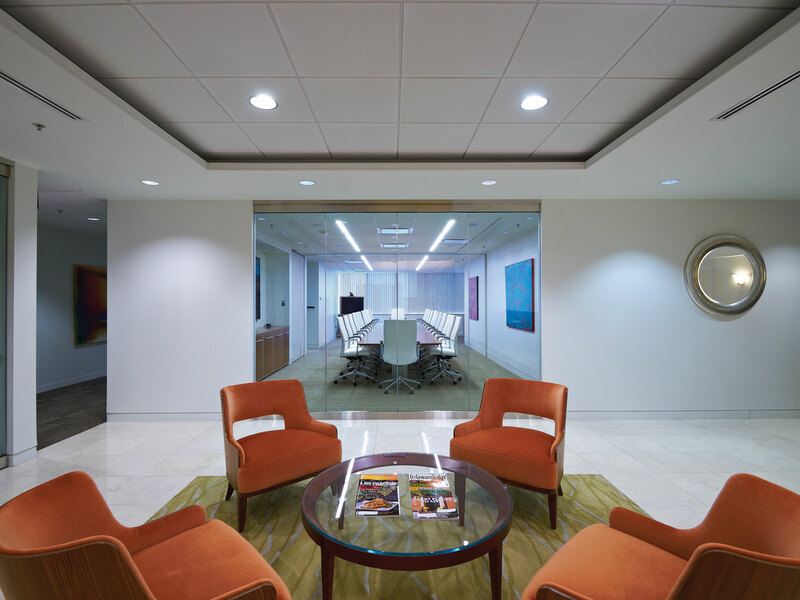 As a result of these upgrades, an additional 46,500 square feet of leases were executed in 2013. Sometimes an industrial property is just a class A office building waiting to happen. When we change the purpose of a structure, we are looking to the future to create something unexpected & ultimately successful. 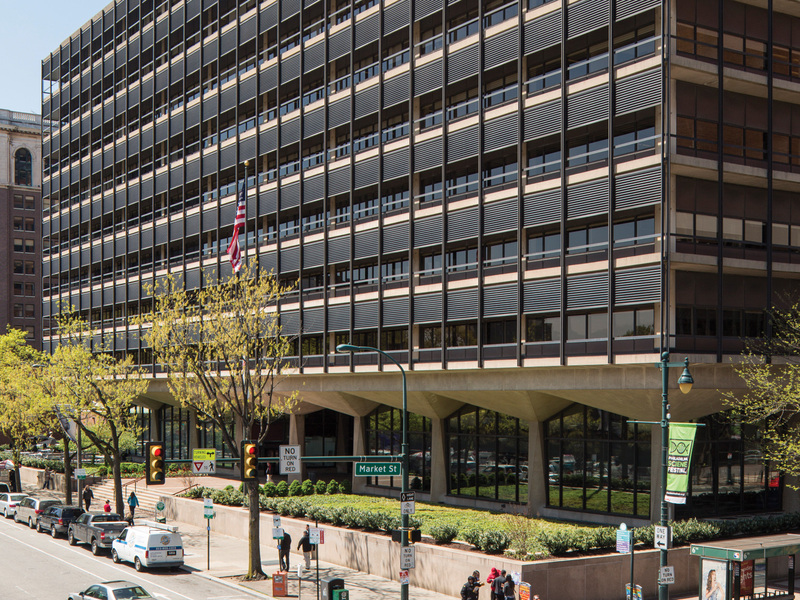 Keystone acquired a Class A, nine-story office building located on historic Independence Mall in Philadelphia’s Central Business District. This building presented an immense opportunity to reinvent the property from a corporate owned/operated/managed facility into a trophy, Class-A CBD asset by upgrading the facilities and amenities. Utilize the existing curb cut and driving ramp to redevelop the 65,000 square feet of vacant basement space into a public parking garage. 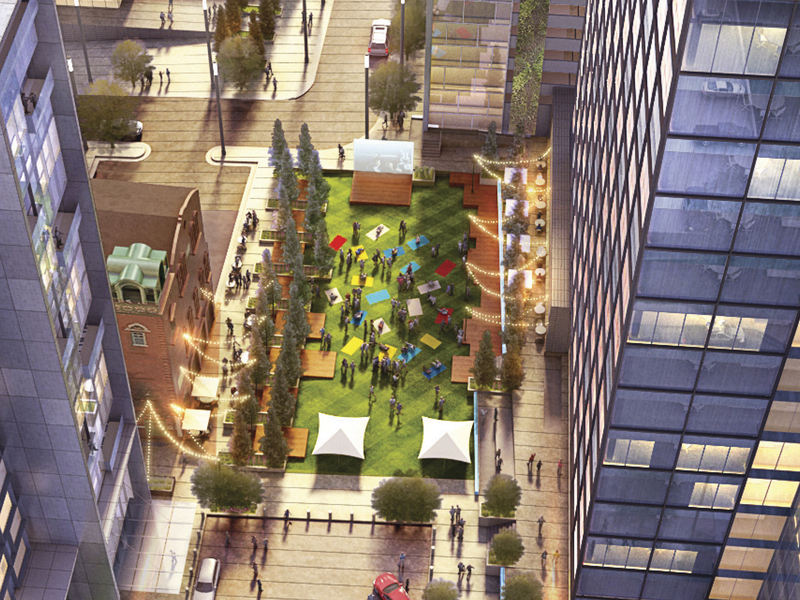 Additionally, Keystone wanted to create an outdoor dining and cocktail experience on the plaza surrounding the property and facing Independence Mall and the Liberty Bell that would cater to the local tourists and corporate tenants. The on-site parking garage with 108 stalls was developed and is now operated by Parkway Corporation, a premier parking operator in Philadelphia. 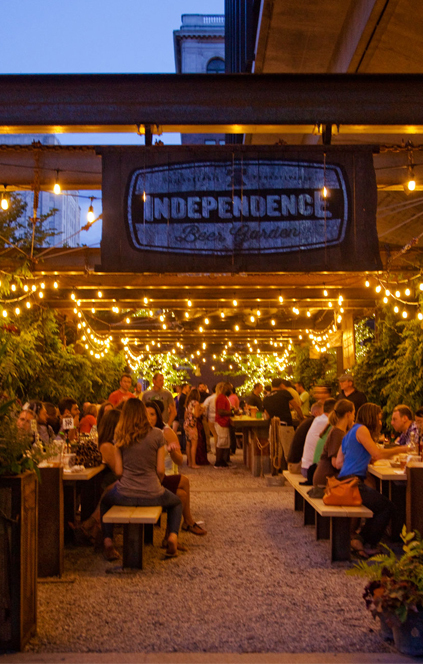 Keystone also leased 15,000 square feet of outdoor patio space to Independence Beer Garden, which is operated by a local celebrity chef. Both amenities opened in July, 2014, less than 12 months from the initial acquisition of the property. Each project was well received by local officials and the surrounding community. 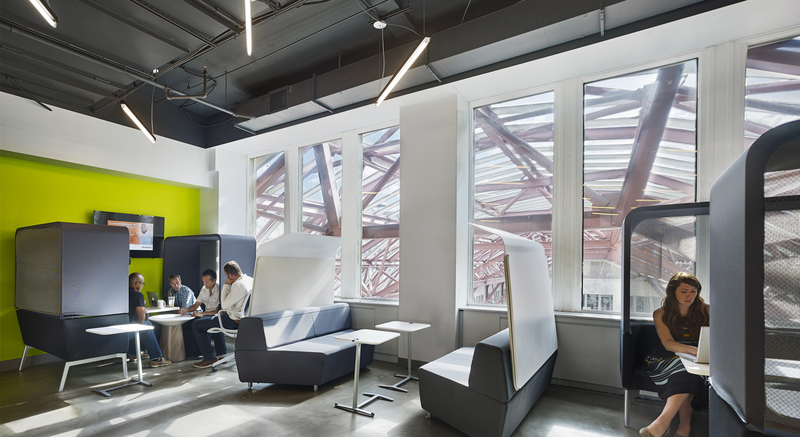 As a result of these transformations, this former dark and quiet corporate building is now a vibrant center of energy. Sometimes properties work better as a team. By assembling proximate assets into dynamic, amenitized campuses, Keystone creates impressive, high-value portfolios. 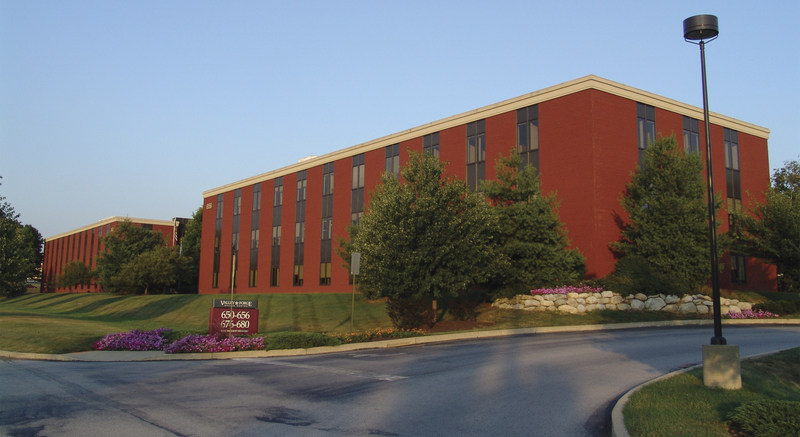 In June 2003, Keystone purchased four buildings located at 1777 Sentry Parkway comprising 227,524 square feet of Class-C office space. 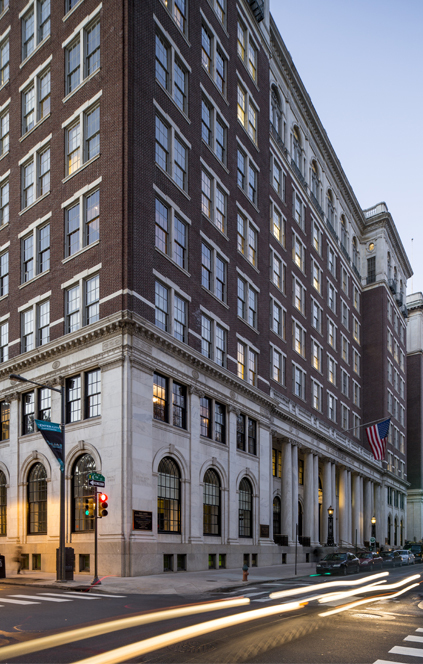 Extensive capital improvements and site upgrades successfully converted the buildings into Class-A assets, dramatically improving rental rates and increasing occupancy. 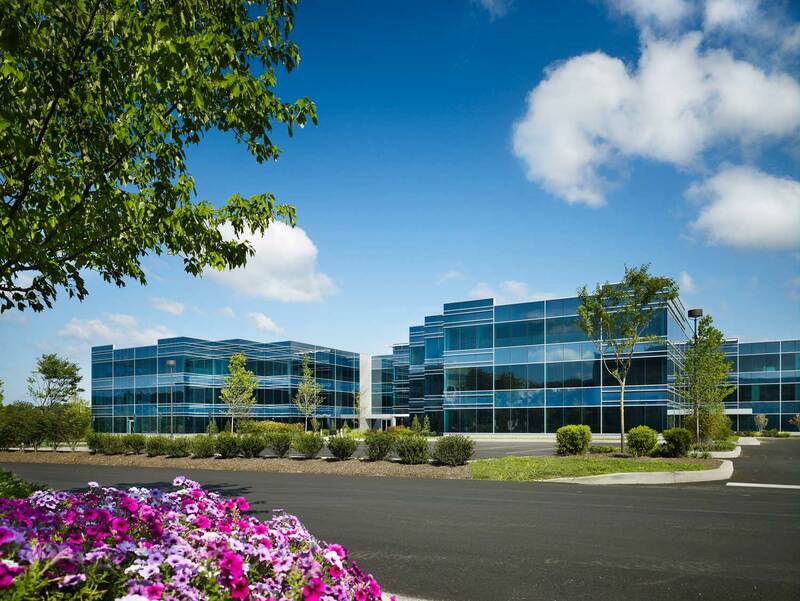 In August 2013, Keystone acquired 16-18 Sentry Parkway, together with 4 and 5 Sentry Parkway, four neighboring buildings totaling 396,342 square feet. 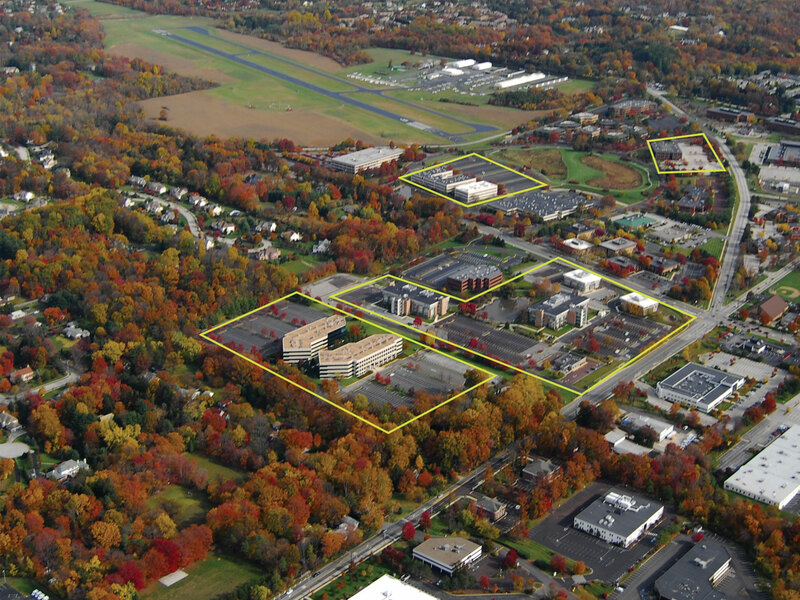 With the acquisition, the entire office park in Sentry Park West was assembled, allowing Keystone to reposition and reinvent the entire park. Planned improvements to 16-18 Sentry Parkway (two, Class-A buildings comprising 193,555 square feet) include renovated lobbies, an outdoor seating plaza, new fitness center, conference room, upscale café/deli, as well as new boulevard entrance and monument signage. 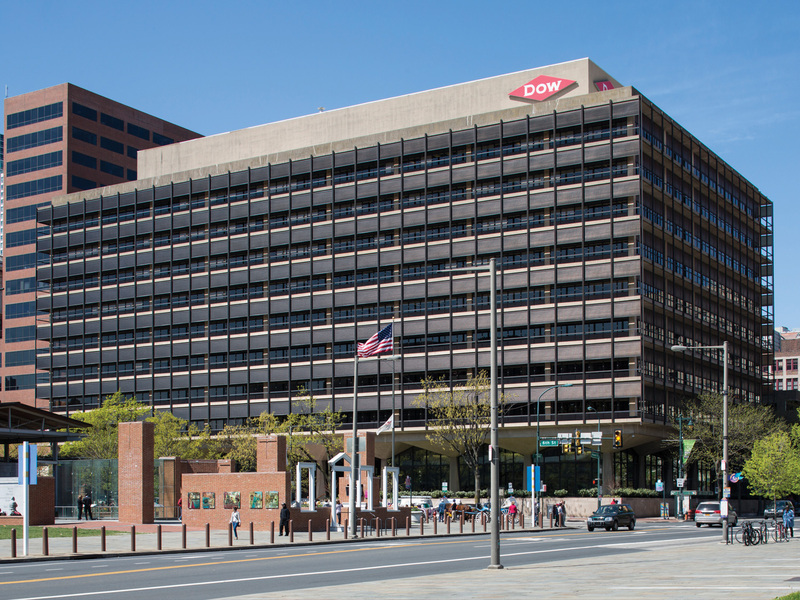 5 Sentry Parkway (two buildings totaling 138,750 square feet) will receive façade improvements, upgraded landscaping and a common area roof deck. Plans for 4 Sentry Parkway (64,037 square feet) include lobby and façade improvements. 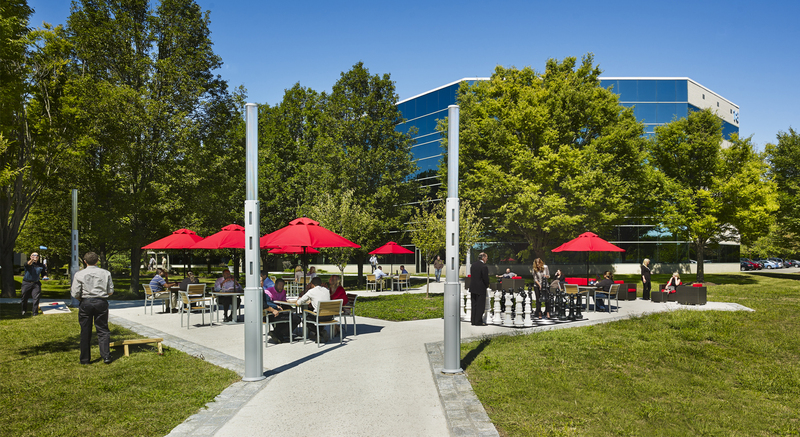 Create an office park with a technology flare and a college campus feel.